Pokemon Paradijs‘Sup, Celebi’ here. In an attempt to set the holiday mood, I’m reviewing Cryogonal from Noble Victories. Nothing says “Winter” like a big deadly snowflake! First things first – stats. 80 HP is pretty strong. It may not be quite as much as the legendary dragons or genies, but it’s much better than the average 60 for a basic. One retreat cost is OK, and Metal Weakness is not a bad one to have. Overall, its stats are fairly good. 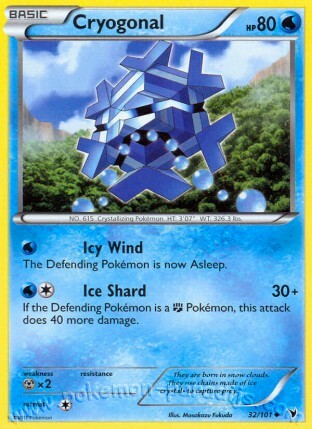 Cryogonal has two attacks, the first of which is called Icy Wind. For one Water Energy, it does no damage but makes the Defending Pokémon Asleep. Could this attack be viable? Not in my opinion. Sleep is probably the weakest of the five status conditions. There’s a 50% chance that it will have no effect on your opponent at all, and since the attack doesn’t do damage either, you’re not likely to make any dent in the opponent’s Pokémon or their strategy. So, Cryogonal’s first attack falls short of playable. How does the second, Ice Shard, measure up? Ice Shard has a manageable WC cost and hits for 30 damage – a pretty low energy-to-damage ratio. However, it does an additional 40 damage if the Defending Pokémon is Fighting type. That mean that any Fighting Pokémon with Weakness to Water will be hit for an insane 140 damage (30+40 times two for Weakness). 140 just happens to be the magic number for OHKOing the most popular Fighting type in our format, Donphan Prime. With its 120 HP plus the Exoskeleton Poké-Body, it becomes really tough to one-shot in most circumstances. But Cryogonal does just enough damage to be a serious threat to any elephants your opponent has on the board. Snowflake > Elephant every time. Cryogonal can outspeed any Donphans it’s faced with. It requires a 3-card combo (Cryogonal and two energy) and is easily searchable with Pokémon Collector. On the other hand, Donphan has to evolve from Phanpy first, and needs three energy to OHKO Cryogonal – a 5-card combination in all. Cryogonal is, without a doubt, the quickest, most efficient hard counter to Donphan in the HS-NV format. However, its playability depends entirely on the amount of Donphan in the metagame. Donphan’s use was declining until Regionals, when The Truth and Donphan & Dragons saw decent success. But now Cities are upon us, and we’ll just have to see how everything plays out. Maybe Donphan variants will increase in numbers and top cut appearances. If so, Cryogonal may become the go-to tech in any decks running Water or Rainbow energy. Because of its dependability on the presence of a certain elephant, Cryogonal is mostly just a meta call, and it earns a 6/10 (Decent). That’s all for today. Have you had any success with Cryogonal in testing? Does it have a chance in the Cities metagame? Remember to rate and comment below. I hope you enjoyed my review, and as always, thanks for reading! I guess in COULD donk Cyndaquils, Tepigs, or babies. How long will it be until coolestman22 says this is a better Donphan counter so Tornadus is useless? Maybe if they whiffed on a basic or a Collector. But even then I’m giving it too much credit. It’s only really good against Donphan and seeing a Tornadus with Eviolite makes Donphan cry anyway . . . I dunno . . . do we even need a Donphan counter anymore? Good point about Tornadus with Eviolite. However, if Zekrom/Eel or Magnezone/Eel stays hot, I would think that Donphan will see a nice little resurgence. Great play if your area runs Donphan, or if you make a format-breaker you can add one of these in there. Don’t knock this card. Crygonal is legit, I ran it in my Club Zekrom deck at cities and donked a cyndaquil game one of the final round. I agree–I’m strongly considering taking the little elephant to a couple CC’s with how much Eel has been going around. If you live in an area with a lot of Zone/Eel or Zek/Eel decks, then this would be a good idea. Donphan isn’t really an issue for ZPST decks any more though, and it isn’t all that useful against much else. It’s funny, I like the other Cryogonal better. As Baby Mario said, do we really even need another Donphan counter? I almost forgot about tornadus, I don’t really think of it a tech, but I suppose it could be. Needing a DCE is just as hard to manage as a Rainbow, and since it can absorb 2 EQ, its basically a draw between Cryognal and Tornadus. I think it just depends on which E you run. Cryagnol is a about 1.5 down the scale from Tornadus… maybe a 6 is ok.
Cryogonal is pretty hossly, but I personally like Basculin with his final gambit more. sure it takes a DC instead of just another energy, but it can also be put to use OHKOing reshis, emboars, SEL and typhlosions. With an eviolite you can get rid of the 25% chance of self KO, and if you’re teching it in with a rainbow, the full 70 damage would allow you to flail OHKO, all except the boar, repeatedly. A lot more fragile and harder to set up, but much more versatile. I think cryogonal is a safer bet, but won’t see much play. What is this? Card of the Week? I played it in a T-Tar/Hydreigon variant for cities and I didn’t see Donphan once. Only time I used it was after Catchering up my opponent’s sole Typhlosion I put it to sleep and it just so happened to stay asleep for 3 turns while I knocked it out with Ice Shard. After my first cities I took it out and still I haven’t seen Donphan. People have been busy lately – maybe during winter break we’ll have some more COTDs. Celebi’ was holding down the fort for a while but she needed to take a breather this month. The problem I see with that is that if you rely on your opponent making the misplay of loading up your outrage, they will simply load up another, benched attacker or catcher you to death =/ If you were running Vileplume and could shut down their switches and catchers than Kyurem is definitely the best counter, but without trainer lock, Donphan decks will have too much support. Yes, but Gyrados MT was also a possible threat without the flail, making your opponent want to get it KO’ed and have them willing to take the risk. I haven’t played with the old cards so IDK how Gyrados usually played out; I’d imagine the power would also make it easier to trick your opponent. How was Gyarados MT a threat without Flail? First of all, its only attack sucked, and Magikarp MT’s other attack was very flippy. I’m saying Kyurem is a counter because of Outrage, not Glaciate. I’m not saying it would be a viable threat, but it would be way more harmful than a glaciate in this context. And I doubt anyone running Donphan will fall into a simple “attack and die” trap if that’s all their opponent is promoting. 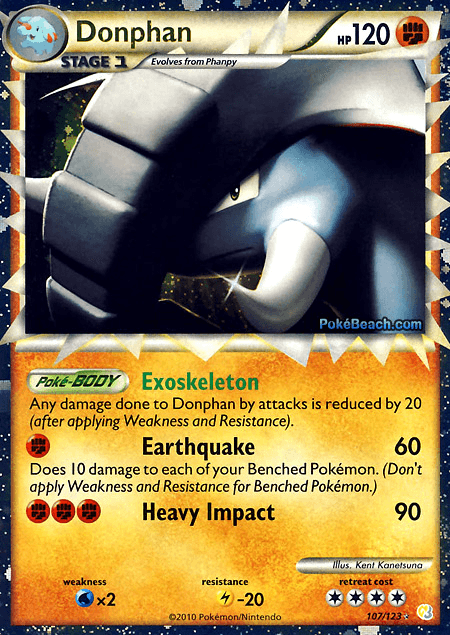 Kyurem is pretty outclassed as a donphan counter; aside from a possible single turn setup, I just don’t see it’s advantage over Basculin, or even Cryogonal. withthis and the upcoming Heatmor, it’s like they are making pokes to kill only certain threats. ….but can be taken down by everything else. sigh. makes me wish we had side decks.